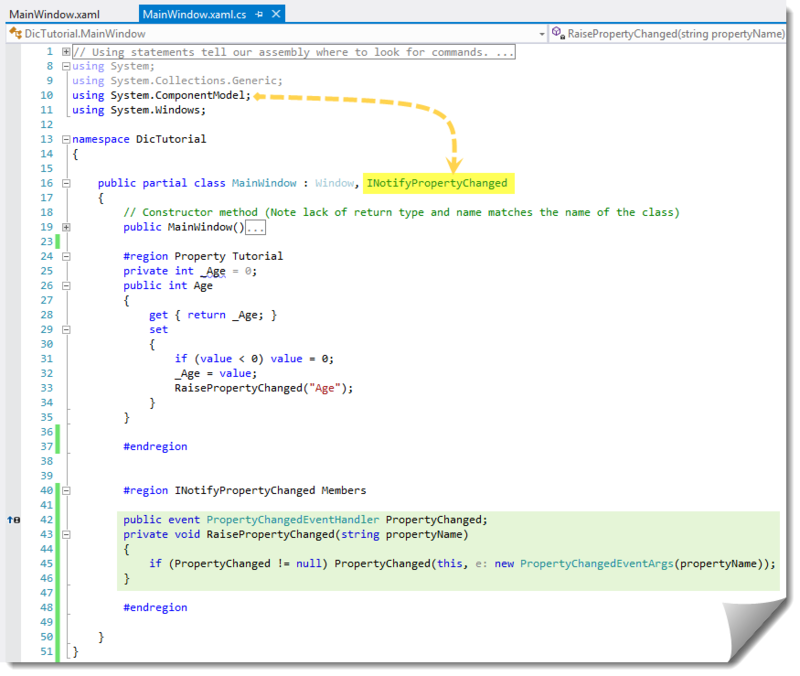 Properties are a central concept in .NET languages and a foundation principal when building classes. They have several advanced features over simple field variables and their use is integrated in many way throughout class interaction. Understanding how to properties work, and more importantly how properties can make your application smarter friendlier and easier to code is vital to advancing your trade-craft as a software developer. The professional coding community uses properties extensively. Its a primary concept. Its how classes communicate with each other. If your code doesn't use them then its going to be a real headache to interact with other classes. Making your code not follow established styles and technology is going to hinder you and make your code something that no co-worker or employer will want to deal with. 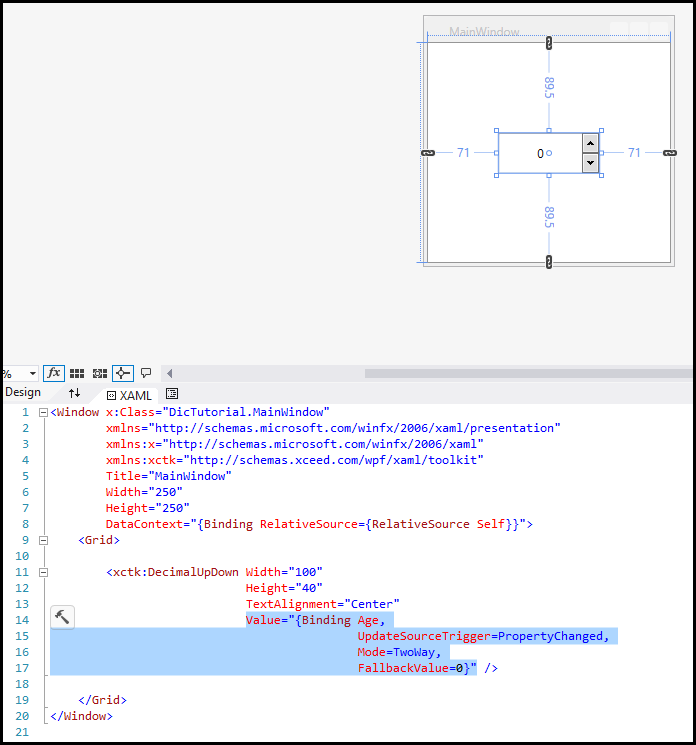 WPF is the new foundation technology for building Windows application GUI's. A few of its advantages over WinForms includes: Built on Direct3D to leverage the power of the video card processor, strong hierarchical design allowing any kind of control to house another controls so one can nest a Lable inside an Image for example. Strong ties to data binding making it more natural to de-couple GUI and data. Developer has a much wider control over look and feel: If you want rounded corner radius of 5 points you can do that. 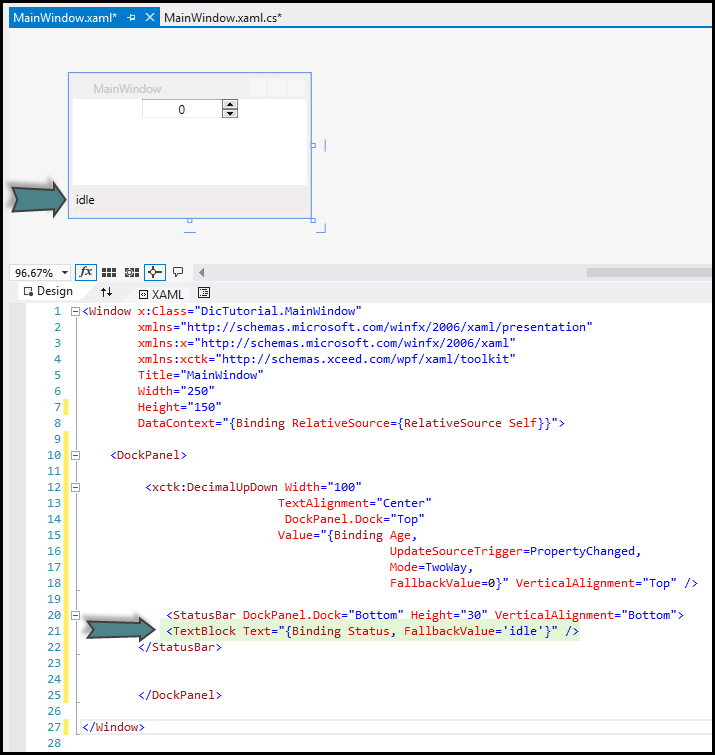 Because it makes use of XAML the developer can establish a style template much like an HTML CSS making it easy to define a style for the entire app: If you want all textboxes to have a blue border you define that in one place. // They let us abreviate our code a little. Note: All examples were created using Visual Studio 2012, targetting the .NET Framework 4.5, using a WPF project. We'll do our best to point out anything that might not work in older versions or ways of using the same techniques in WinForms. are exactly the same thing. "So why do I care about properties?" is probably your first through. Because as mentioned they are an advanced construct. In reality they are a wrapper around a get and set method. Let me say that again: Properties are a wrapper around two methods. And as we know methods are exectuable code that can do things and make comparrisons and decisions. Simple variables can't do anything. In its simplest syntax a property can be autoset, meaning it has no backing field variable (more on this in a sec., so don't panic) The Name property above is an autoset property. It has a get and a set method that contain nothing. It will act exactly like any other variable. But that's like using a Ferrari to get groceries: Its under utilizing the tools at your disposal. That is the value being passed in. You can work with that value within the get method. The only condition on this is that as soon as you start doing these things you have to have a backing variable for the property. The value has to be stored someplace while the methods do their job. Let's see it in action so it becomes clear. If you had a simple int variable for someone's age your code would have to validate it everyplace you used it. A typical program might refer to the Age 100 times. What if somewhere in all that our calculation screwed up? Do we really want to have to qualify every calculation every time? Worse yet, what if there are new rules put into place about validating age: We would have to scrub through thousands of lines of code and copy/paste the new rules into the 100 places we do it. YUCK! For example, what if the age was accidentally set to a negative number? Its legal for an int to be -4, but that's not a valid age. But the get method executes on incoming values. We can make an age property that does this for us one time, in one place so we don't have to validate the age in 100 places. // In the course of our work we update the Age property. Age = -18; // Sending -18 as the value to the set method within the Age property. You have a window and on it are various controls with information about a persion: Name, age, address, phone number etc. When a user inputs a change you want the property to update. By the same token if the age updates from an programmatic source (like a database update) you want the GUI to update automatically. This is exactly the same as say a calculator. When the math is done the Answer property is updated and you want that to be shown on screen. Or you are writting a chat program and the Message property updates when a new message is received.... Or you are watching a USB weather station and the Temperature gets a new value so you want that on-screen. This is pretty much how any program should work: The work class does the work and the GUI acts as an interface between the user and the work. So instead we want to just raise up a notice (an event) that the data has been updated. The data class doesn't know or care who's listening: That's the responsiblity of the listener to update itself. Not the responsibility of a pure data class to fix up the GUI. Line 9: add a using statement for System.ComponentModel because that's where interface INotifyPropertyChanged lives. That stuff is just one time, to get our class prepped. You don't do that for every property. Line 33: When the property gets changed, raise an event saying so. Then on our WPF window we bind the .Value of the control to the Age property, speicfying two way. That way when the property is changed the GUI is updated, and when the GUI is changed the property is updated. Now that all the groundwork has been laid we can add as many easy-to-bind properties as we like. For a contact card we might add Name, address and so on to our existing Age property. One of my most common uses is to give the user status updates on the status bar at the bottom of the window. Add all we had to do was add one more property that that reports when it has a change. Now we can give the user status updates easily with a single line from any method in our application. There is even more advanced features about properties. But this tutorial is already getting pretty long. We've covered the basics about what properties are and even some intermediate stuff about cool ways to use them. Hopefully this will get you thinking, and using properties as much as possible. Some people and some programs such as StyleCop or ReSharper will suggest renaming _Age to _age because it is a private field. That's just a very common style convention. I don't follow it because of something I've learned over time: Find and Replace is best used when case sensitive. I like naming everything that has to do with the same purpose using the exact same term, so if I have to Find/Replace everything related gets changed together. All of these will rename together and the same if I Find/Replace "Age" with "CustomerAge"
Very Nice Tut, Thank you. Hope it helps. Your mileage may vary. Close cover before striking. Don't tug on Superman's cape. Wonderful job with these tutorials, I'm sure they'll be a massive help to people who are starting out. Well I also think these tut's are great for the seasoned programmer also. A new prospective on something is nothing but a great thing. 07dec12 - This tutorial has been read nearly 4,000 times but only 8 people ticked it as a good topic. Is it really that bad? Is it hard to understand? Did I not cover material you, the reader, really need or want? I can't improve the quality of my tutorial writing style without feedback from you. As for me I like tuts like this because it helps me clean up my thinking and gives me the syntax I need for putting a new language to use. I use classes and properties in VBA all the time, but there is nothing to compare with INotifyPropertyChanged. That's what I needed. I knew what a property was but read through this tutorial anyway. Glad I did. I'm finding all these tutorials really useful, as I'm slowly dragging myself into the world of OOP and .Net from VB6. Thanks for the kind words. That's what keeps us motivated to make more when we have spare time. Great tutorial. Every one of your tutorials that I've read has been useful to me, even ones over basic topics like this, because I always learn something. Thank you for all of your work on these; I'm reasonably certain that a majority of the problems posted in the various .NET forums would never be posted if users were forced to read all of the links in your various sigs before they were allowed to post. I know your stuff has helped me numerous times. Very good. Thanks for your effort. Already I am intimidated and wondering what!?! I get it is a public class - that you have an argument & an eventhandler to handle the argument ... but this is a bit of a mystery to me still. Interestingly - I am taking a college course - I am able to throw basic programs together pretty quick - or at least I am getting quicker - but I am being taught how to code behind the object. Am I just trying to figure too much out too quickly. You seem to think this is basic so I can't help but wonder why I feel I am getting it in class but in the 'read world' I feel as if I am not getting it at all. Encouraging feedback would be appreciated as I am wondering what in the world have I gotten myself into here. Is defining a class called TextArgs that is a subtype (or inherits from) the class EventArgs which is the basetype. In vb.net it is the following. So - I am still confused cuz I don't even see the event anywhere else - how would the code that referenced this event look & what is the purpose of this code? C# Reading Xml Value To Int?